Finally, it’s here: One platform which serves all digital billboard brands! Formetco’s F360 Enterprise Grade Software Platform, is new to market, web-based software, which serves as a single interface to manage the health, service and schedule of digital billboards. Delivering the viewing experience your advertisers and audiences have come to expect; F360 reduces time and effort for scheduling and promotes flexible sales options to improve competitive position for billboard operators in varying market conditions. Formetco actively supports OOH’s collective success. Introducing F360, as a signage solution that impresses for visual impact and to function reliably over time for all billboard operators. * Provide simple ad scheduling regardless of digital billboard brand. 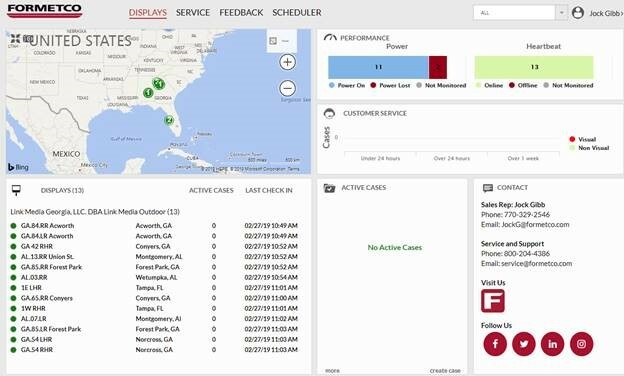 Logging into F360, any billboard operator will now have one centralized place to view the key health indicators for all their displays regardless of brand, number of displays and multiplicity of manufacturers. Formetco’s new software platform reinforces ongoing efforts to unifying a fragmented digital #OOH industry while continuing pioneering the path of inclusiveness for the benefit of all billboard operators. F360 is the only enterprise grade scheduler provided by a digital manufacturer in the Industry. The robust platform was inspired by IBO Fusion and developed in cooperation with Apparatix, using an open architecture, thereby preparing for rapid industry and technology changes. F360 reduces time and effort for scheduling and promotes flexible sales options to improve competitive position for billboard operators in varying market conditions.